Want to protect your leather recliner from scratches, bumps, and bruises from daily wear and tear, or maybe even just from fading or deteriorating in the sun. The one thing you need is a proper slipcover, in a non-slip material and design. Keep in mind that any leather, whether faux or genuine, leather is slippery when you cover it, therefore, I have invested some time to find you the best non-slip, slipcovers to keep your precious leather recliner in tip-top shape. I can tell you from personal experience in a household with two toddler girls, four cats and two large dogs, my $2700 genuine leather recliner set has taken its toll in scratches, scuffs and staining. And believe me even with a leather recliner some stains just do not budge, no matter how hard you try. Your recliner whether a set, expensive, or not, it is still an investment, and one that I am sure you want to last, so protecting it from the elements, and in some cases, kids and family pets are quite important. A cover will provide protection against sun and weather damage. Your leather recliner will be protected against general wear and tear, as well as dust, build up. Washing and cleaning a cover is much easier than cleaning a leather recliner. Your recliner is protected against spills and stains, and you don’t have to worry about stains that won’t come out. A cover likewise protects against pet scratches and bites, scuffs, and abrasions. You can easily change the color scheme or your décor style with the addition of a decorative cover for your recliner. Hideaway wear and tear in an old recliner that still works perfectly with a cover. Use the cover when guests or family come over to protect your seats against messy children, or in some cases adults, as the good times progress! Keep your leather recliner protected while you pain or decorate the area with a less expensive cover. Firstly as a tip, any cover with sponge backing, or using sponge backing underneath your slipcover is an excellent hack to keep your cover perfectly in place. Cotton is crisp, fresh and breathable with a light and natural texture. It is likewise easy to clean and durable. Twill usually consist of a cotton and polyester blend and is a light fabric with low thread counts. It is durable and easily resists staining and water damage. Suede is a thin leather with a napped finish that has a luxurious and velvety soft texture. It is stain and water resistant while being able to withstand plenty of wear and tear. Stretch material is usually made from polyester and spandex to easily fit any size and shape recliner, with the added benefits of giving you a wider color and pattern choice. Any polyester cotton blend results in a durable, strong, wrinkle resistant and lightweight fabric that can resist high temperatures and breathe easily. Most covers are made in this material, and it is very easy to care for. This will generally depend on your lifestyle requirements and your budget. You can consider a ready-made cover which can be found from general retails and are easy to come by, they will likewise fit most recliner sizes, although you do need to make sure of the dimensions. Or you can have a slipcover custom made, which can turn out quite expensive as you will need to purchase the material and all the trimmings, and still pay for labor. In turn, you will also need to find a reputable and trustworthy upholsterer that can make you a custom cover. The first step is to measure the dimensions of your recliner that you want to cover and check for these when you find a cover that you like. As we have discussed you have a few fabric options to choose from, but check that it comes with a backing that is an either sponge or a non-slip material because some fabric types tend to slip on leather. Like with everything else in life, it’s the small things that count most. Look at details such as dust ruffles, buttons, trimmings, textures, and prints, as well as features that offer leg is covering and a neat finish. At the end of the day, you want your slipcover to work for you, it should be easy to place on your recliner, and just as easy to remove. Then you will also need something that is easily washable, preferably machine washable, and quick drying. 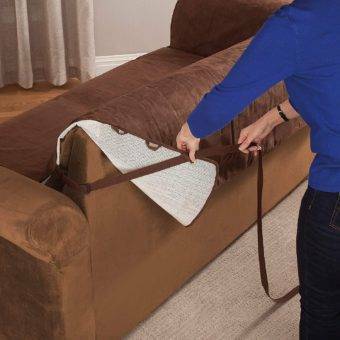 This is the ideal cover for a household with pets, and, or children, as it is highly durable, water resistant and will work well on any sized leather recliner. Features stay put straps that ensure that the cover stays perfectly in place, even on a very slippery leather recliner. Made from tough and durable micro-suede fabric that is water resistant, wear and tear resistant, and super smooth and comfortable to the touch. Also features a thick layer of anti-slip backing, that further keeps the recliner chair cover in place. Available in black, chocolate brown or a natural tan color option for you to choose from. The Easy-Going recliner slipcover is made to fit any recliner giving it a PU leather appearance, with a non-slip and waterproof, stretch fabric construction. Likewise, a great option if you have pets and children. A stretchy fit that will easily cover almost any size and shape of the recliner. It is manufactured from Polyester and spandex with 40% Pu material and elastic straps for the perfect fit. Change your fabric or leather recliner into a PU leather recliner and change up the color scheme with these nifty covers. A useful storage pocket at the side. Provides a luxury look with protection against water, spills, stains, and daily wear and tear. The no slide straps tie on hooks at the bottom for the slipcover to stay perfectly in place. Provides complete cover for your entire recliner. Available in Beige, Black, Navy, Wine, Coffee, and Dark Grey color options for your perusal. A luxuriously appealing cover with cube patterns, that is slightly padded with anti-slip padding, perfect for an oversized leather recliner. No more slipping with this highly functional anti-slip pad cover, that features an additional elastic strap for easy and slip proof installation. Will fit a larger sized recliner of up to 30 inches. Protects your furniture from pet hair and scratches, as well as spills and stains. Very easily washable in your washing machine, and quick to line dry. Available in a fit for a chair, futon, loveseat, oversized recliner, and a sofa. The Turquoize Waterproof Slip cover is the ideal non-slip cover for every family. Perfect for pets, children, with long lasting waterproof durability and an anti-skid design. Available in Brown, Grey, Stone Blue, and Taupe color options, as well as sizes to fit a Chair, Loveseat and both standard or oversized sofa and recliner. A 100% completely waterproof slipcover with anti-water silicone rubber backing in the shape of puppy prints, that also offer excellent anti-slip properties. A highly versatile product that keeps your furniture clear of pet hair, stains, dirt, spills, as well as maintaining the fresh look and aesthetic appeal of your recliner. Offers lasting strength and durability with anti-skid technology, to keep your cover on your recliner firmly. Easily machine washable, although avoid too hot temperatures, and drying in the dryer as this can damage the waterproof covering. Wintertime, and you just cannot face those cold leather seats, well then why not have a change of style and upholstery with the simple use of a slipcover. This gorgeous textured slipcover is stretchable, lightweight and has a warm cozy feel to it. A durable and lightweight design in stretchable fabric with a decorative grid design that will give your old recliner a great new makeover. The four pieces elastic stretch cover features a separate footrest cover, and has built-in elastic corners to keep the cover in place. The cover features a convenient opening to accommodate manual recliners that have a lever. Very easy to install with the instructional tabs to guide you, as well as fully machine washable. There is a handy side pocket to store small items in. 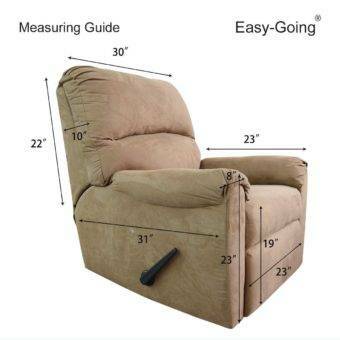 Comes in a size that will ideally fit all standard sized 30-40 inch recliners. Whether you just want to give your recliner a brand new makeover, or protect it from children and pets, or daily wear and tear, a slipcover is a great choice for all these reasons.